Despite a national cleanup effort two decades ago to eliminate the notorious Mr. Fluffy-brand asbestos products from homes in Australia, new evidence shows more than a thousand of those homes still are toxic. Australian Capital Territory (ACT) government officials recently discovered that homes in Canberra, previously deemed safe after asbestos removal programs in the 1980s, still contained asbestos fibers in the walls, under the houses and inside living spaces. Exposure to asbestos is linked to the development of mesothelioma and other serious and potentially fatal respiratory diseases and cancers. Residents of other homes suspected of still containing Mr. Fluffy insulation were issued letters warning them about the possible dangers of asbestos exposure. While the government is demolishing some Canberra homes, homeowners in nearby Queanbeyan, in New South Wales, report they also have Mr. Fluffy insulation in their homes. Mr. Fluffy is a name that strikes fear in the hearts of many Australians because of its tainted history and the countless cases of mesothelioma caused by the company’s asbestos products. Australia’s high incidence of mesothelioma is related to the country’s extensive use of asbestos. Experts say the country had the highest per capita rate of asbestos use in the world from the 1950s to the 1970s. During the 1960s and 1970s, an estimated 1,000 homes scattered across Canberra and New South Wales were insulted by the Mr. Fluffy company. It boasted that its insulation product was the most efficient. Marketed as “Asbestosfluf” because of its light and fluffy appearance, workers pumped the loose asbestos into roofing spaces. Workers informed the residents the insulation would be eternally effective. Not only was that insulation effective, but it was long-lasting, despite efforts to eliminate it from homes. Several government initiatives attempted to remove the asbestos-laden insulation from homes, but these new reports show those efforts were not as effective as previously documented. Arthur Spears, an Australian health official in the 1960s, deemed Mr. Fluffy insulation dangerous. His advice was ignored and Mr. Fluffy workers continued insulating homes with the loose asbestos for another 11 years. Dirk Jansen, the owner of the company, ceased operations in the late 1970s and died in 2001. Following his death, Jansen’s family expressed deep sympathy for more than 1,000 families affected by the company’s asbestos products. Reports show no legal cases were brought against his estate. Use of amosite asbestos was banned in Australia in 1989. ABC TV in Australia recently interviewed Lisa Ziolkowski on its “7.30” current affairs program. She is one of the Canberra residents who received a letter warning her about possible asbestos contamination in her home. Ziolkowski said assessors claimed they tested her family’s house twice and found nothing. She doubted their results because samples were never taken for testing. A third assessor returned to examine a burst pipe and again assured her there was no asbestos in the home. Ziolkowski later found gaps in the walls and called an assessor for the fourth time. The results: “Blue asbestos dust, so microscopic it couldn’t be seen with the naked eye, was found in the living areas, the bedrooms and the children’s cupboards. They’ve been breathing it in for several years. It was blowing through the heating system,” a transcript of the TV program shows. The house they abandoned cannot be lived in or sold, and they cannot afford to have it demolished. Regardless, they still have to pay the rates and utilities for their house, and the rent on their new accommodation has put the family at risk of financial ruin. The Ziolkowskis are one of many families dealing with similar circumstances across Australia and unfortunately, it is unclear how many more families will be affected. 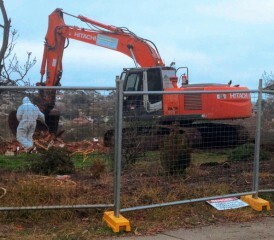 There are unknown numbers of residences surrounding ACT, including Queanbeyan and Batemans Bay in New South Wales, which were not included in the asbestos cleanup. Until these homes can be tested, there is no way for the families to know if the asbestos insulation in their roofs has infiltrated living areas and put their lives and the lives of their children at risk. The Australian Government’s Asbestos Safety and Eradication Agency recently revised the National Asbestos Exposure Register and opened it for Canberra residents possibly affected by Mr. Fluffy insulation products. The register previously only covered general exposure to asbestos in the home and workplace and did not allow for circumstances surrounding loose-filled asbestos insulation. As the asbestos situation continues to worsen in ACT and New South Wales, another possible disaster is looming in Sydney. Evidence contained in a newly discovered government report suggests another insulation company may have been pumping loose asbestos in Sydney homes for years. The Mr. Fluffy crisis is one that continues to affect Australian families decades after failed cleanup attempts, and the current problems show the consequences of when government officials do not take eradication efforts more seriously and ignore health warnings.